Stuck in Seattle? Backed up in Bellevue? 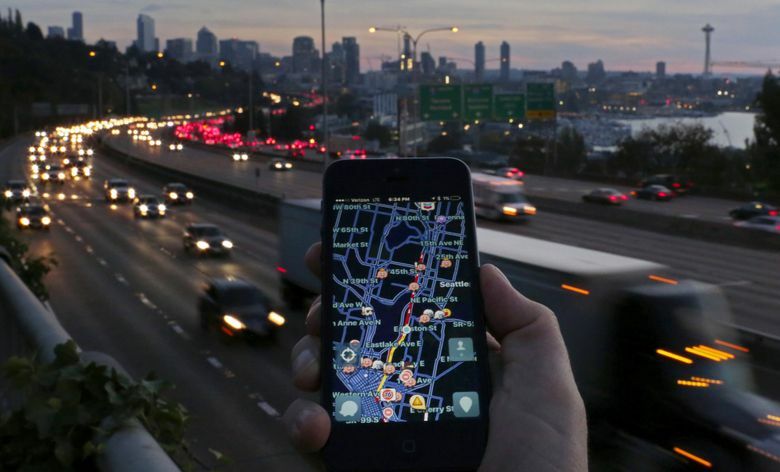 As traffic worsens around Puget Sound, transportation apps become more important. But they’re only as good as their underlying data. Seattle-area drivers are dealing with historic gridlock. Traffic volumes and travel times are climbing. Sometimes it seems that if there’s not a flaming bus on the shoulder roughing up your commute, it could be the Chinese president’s entourage or a spilled truckload of bees to blame. One wreck can clog freeways and surface streets for hours. When a fish truck crashed and closed Highway 99 for nearly nine hours in March, it took drivers an hour to travel less than two miles on Mercer Street. That a single wreck could wreak such havoc highlighted “the fragility of the system,” Scott Kubly, Seattle’s transportation director, said at the time. Commuters have turned to a variety of apps for relief — from Waze to OneBusAway. And behind the scenes, governments, private companies and garage hobbyists are tinkering with a mixture of public and private data that feeds those apps. They believe better information could help make stressed infrastructure more efficient. The worst Seattle-area traffic jams of 2015. State report: More drivers, more gridlock, more delays. “It’s expensive to run additional bus service and really expensive to build rail systems and increase road capacity,” said Alan Borning, a University of Washington computer science professor and a OneBusAway board member. Developers layer massive amounts of public and private data to help you get around. Take Google Maps, for example. You can now compare real-time driving, walking, biking and transit routes with the app. You’re also ever-so-conveniently provided with a quote and ride-time estimate from Uber, a partner of Google. The apps are only as good as the data that feeds them, though. So for app makers, “the question becomes: What data can you get your hands on?” said Mark Hallenbeck, director of the Washington State Transportation Center (TRAC). Much of it comes from you. Google tracks your phone’s GPS data to map congestion, and in 2013, it bought Waze — one part map, one part social network, where drivers create and share their own posts about traffic conditions. “We’re trying to share as much data as possible between the two systems,” Ferris said. In June, Google Maps also began pulling in public transit data from OneBusAway, a project Ferris began as a University of Washington Ph.D. student in 2008. 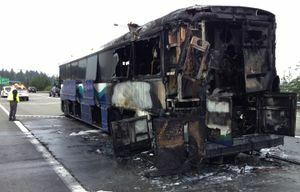 It operated for about five years from the UW, and Sound Transit took control of the OneBusAway servers in 2013. The system pulls data from eight transit agencies, including King County Metro, and spits the information out to apps like Google Maps and OneBusAway (the popular app is maintained separately from Sound Transit by a team of volunteers). Any app developer can use the data. Berman said Sound Transit wants to roll more transit-agency data into OneBusAway. Other agencies, like King County Metro, are working to fix problems with it. Ever waited at a bus stop and watched its arrival time vacillate from five minutes away to two minutes gone and then back to a seven-minute wait? Metro hopes to have the issue fixed by the end of next year. “A bus, as it’s driving down the road, sends a position update every 90 seconds over a private two-way radio system,” said Dan Overgaard, manager of systems development and operations. OneBusAway servers compare that location signal to the bus schedule, and make calculations about where the bus should be. It sends those calculations to your Google Maps or OneBusAway smartphone app. But quirks in the system can choke that data. You might see predictions “jumping around” because the system has a hard time telling the beginning of routes from the end, Overgaard explained. Bus drivers may have a scheduled break in between routes that the system does not understand. “Once the bus starts the next trip, it syncs up again and gives you more accurate arrival time,” said Overgaard. At the beginning and end of routes, the data are less reliable. Another frustration for users is that OneBusAway only tracks buses, not Link or Sounder trains. Sound Transit hopes to incorporate that data into the OneBusAway feed next year. The most vexing problem: Sometimes your bus doesn’t show because the president’s in town or a crash on the Aurora Bridge takes out a major thoroughfare. If a bus stop moves, “We don’t have a good way to change the data or alert people to that change” through apps, said Overgaard. Meantime, Seattle is trying to get app developers to think creatively about the data already available. The city held an event called Hack the Commute in March. Projects included a ferry-schedule app, a carpooling app and a sensor project that would determine whether bike racks on buses are full. Aaron Brethorst, a volunteer who maintains the OneBusAway iPhone app, worked on a project that would allow commuters to share their transit experience with Waze-like social alerts. “If you’ve been passed by two RapidRide buses on Aurora in a row, you should be able to alert riders ahead,” Brethorst said. The project stalled when Brethorst and OneBusAway decided to focus on “low-hanging fruit” like making the app faster and compatible with the Apple Watch. One hurdle: Brethorst said his hacking group determined user-submitted reports would have to be stored separate from SoundTransit’s system. Server space would have to be donated or paid for out of pocket by Brethorst and other volunteers, he said. The hackathon’s winning team, from the UW, is still developing its concept, called “Access Map,” a Web app designed to give people in wheelchairs or with mobility issues route information that factors elevation, construction, curb cuts and other accessibility data. A prototype could be online in about a month. While tech companies and hackers chip away at these projects, however, the underlying problem remains: Too many vehicles in too little space. All the apps in the world can’t solve that.